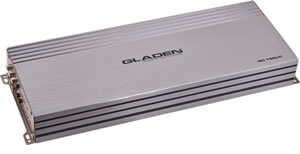 New from Gladen Audio, a 5 channel amplifier to power your complete audio system with no need for any other external amplifiers. Power your front, rear AND your subwoofer with this amplifier! Producing 4 x 90wrms on the front and rear channels, and a whopping 560wrms on channel 5 at 2ohms for your subwoofer! Want to use your existing OEM stereo? Then no problem as the RC150c5 is capable of auto sensing and accepting a high level input direct from your factory fitted head unit. This version comes with a bluetooth audio reciever which allows you to stream your music straight into the amplifier...perfect for those tablet installs!